“We can see the outlines of a population of black holes emerge,” said Richard O’Shaughnessy, associate professor in RIT’s School of Mathematical Sciences. The LIGO paper cites O’Shaughnessy’s upcoming research, which was used in part, to help interpret the most recent event. He will present his work at the American Astronomical Society on June 5 in Austin, Texas. The new observations rule out the possibility that pairs of heavy black holes have a lot of net-aligned spin and agree with LIGO’s 2015 breakthrough observation, he noted. Research at RIT’s Center for Computational Relativity and Gravitation is advancing techniques for understanding that crucial astrophysical parameter—spin, said Carlos Lousto, professor in RIT’s School of Mathematical Sciences. “At RIT, we are working on improving the spin measurements of the black holes by solving to high accuracy Einstein’s equations and directly comparing those theoretical predictions with LIGO’s observed signals,” Lousto said. Researchers in RIT’s Center for Computational Relativity and Gravitation directly compared gravitational wave signals to their computer simulations based on Albert Einstein’s equations. The recent observations further tested Einstein’s general theory of relativity and prediction that gravitational waves always move at the speed of light. LIGO saw no evidence that the waves travelled at different speeds. “This third event lies in an mass range intermediate to the previous two events and shows that black hole mergers are common in the universe,” said Manuela Campanelli, director of RIT’s Center for Computational Relativity and Gravitation and Frontier in Gravitational Astrophysics, an RIT signature research area. RIT members of the LIGO Scientific Collaboration include John Bero, Hans-Peter Bischof, Manula Campanelli, James Healy, Brennan Ireland, Jacob Lange, Carlos Lousto, Rupal Mittal, Richard O'Shaughnessy, Monica Rizzo, Nicole Rosato, John Whelan, Andrew Williamson, Jared Wofford, Daniel Wysocki, Yuanhao Zhang and Yosef Zlochower. The international collaboration has about 1,000 members who perform LIGO research together with the European-based Virgo Collaboration. The new detection occurred during LIGO’s current observing run, which began Nov. 30, 2016, and will continue through the summer. 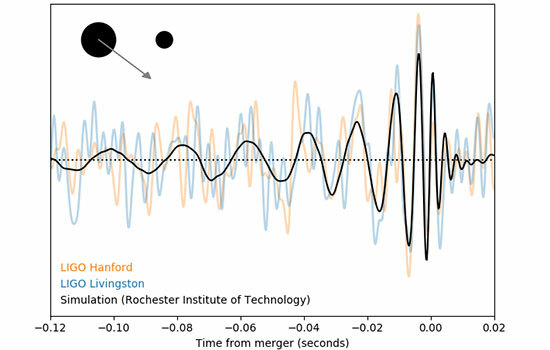 LIGO observations are carried out by twin detectors—one in Hanford, Wash., and the other in Livingston, La.—operated by Caltech and Massachusetts Institute of Technology with funding from the National Science Foundation. LIGO is funded by the National Science Foundation, and operated by MIT and Caltech, which conceived and built the project. Financial support for the Advanced LIGO project was led by NSF with Germany (Max Planck Society), the U.K. (Science and Technology Facilities Council) and Australia (Australian Research Council) making significant commitments and contributions to the project. More than 1,000 scientists from around the world participate in the effort through the LIGO Scientific Collaboration, which includes the GEO Collaboration. LIGO partners with the Virgo Collaboration, a consortium including 280 additional scientists throughout Europe supported by the Centre National de la Recherche Scientifique,, the Istituto Nazionale di Fisica Nucleare,, and Nikhef, as well as Virgo’s host institution, the European Gravitational Observatory. Additional partners are listed at http://ligo.org/partners.php.